Using advanced microprocessor technology, Delta AC Drive has been offered to our valued clientele. 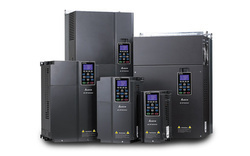 These AC drives are used in air conditioners of large capacity, wastewater treatment system, wood carving machines, escalators and several others. We ensure our prospects efficient control on motor speed. We have designed these AC drives which lead to accurate controlling of speed & torque and smooth handling of increased loads. Application : Woodcarving machine; crane hoisting; drilling machine; CNC lathe; tooling machine; middle/low-speed passenger elevator; PCB routing machine, etc. Application : Packing machine; dumpling machine; treadmill; temperature/humidity control fan for agriculture and aquaculture; mixer for food processing; grinding machine; drilling machine; small size hydraulic lathe; elevator; coating equipment; small size milling machine; robot arm of injection machine (clamp); wood machine (two-side woodworking planer); edge bending machine, elasticizer, etc.